Ducati Multistrada 1260 price starts at Rs.15.99 lakh (Ex-Showroom, Delhi) and the top end variant Ducati Multistrada 1260 Pikes Peak is priced at Rs. 21.42 lakh (Ex-Showroom, Delhi). Powering the Ducati Multistrada 1260 is a 1262cc Ducati Testastretta DVT L-twin engine. Mated to a 6-speed slipper clutch enabled transmission, this powerplant produces 157.9PS at 9500rpm and 129.5Nm at 7500rpm. The torque delivery from this new motor is brisk at low revs. 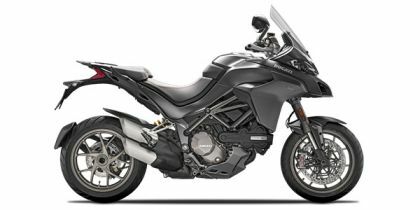 To keep things under control, the Multistrada gets cornering ABS, Ducati Traction Control, Ducati Wheelie Control, Vehicle Hold Control, Cruise Control, riding and power modes.